In today’s tutorial for thesis theme users, I’ll share how to add a featured post slider to thesis WordPress theme. Featured post sliders are best to showcase your best posts on homepage. You can add posts with breaking news or latest giveaways to featured post slider to gain more attention of your readers. Note: This tutorial require that you install thesis WordPress theme to your blog first. If you don’t have thesis theme, you can get it now. Step 2. After installation, activate the plugin. Step 3. Now you need to add some posts to the slider. For this purpose, go to Dashboard -> Posts and click on Edit under a published post. Now scroll down to the page and check Add this post to smooth slider. After this update the post. Step 4. Navigate to Thesis -> Custom File Editor and select custom_functions.php and add the following code to it. After you add the code, click on Bug Save button. Step 5. Now navigate to your blog homepage and check the slider. It’s working now. But you may need some customization to make to look like your blog theme. Step 6. 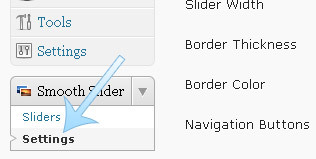 Open Smooth Slider settings from left sidebar of your WordPress dashboard. Step 7. On the settings page, you can customize the slider width, height, border and navigation buttons. You can also customize font type, color and styles. Once you are done with all the required settings, click on the Save Changes button. That’s all to add a featured post slider to thesis WordPress theme. I hope you like this tutorial. If you face any problem in any step, feel free to drop your comments here. It looks cool,i am using it from past 4 months and it works fine without compromising with the page loading time.Readers for a live demo of this slider you can check our homepage.I turned it into a trending stories widget,update its post every 4 days.Mostly viewed stories of 4 days are displayed as trending stories on it. thanks for this article, one question though how to remove smooth slider link after read more text? I used to use the Featuredcontentgallery plugin, but have had many problems with it, a little too complicated to keep changing stuff. I will give the smooth slider a try seems easier than other similar plugins. Nice post! Looking forward to your blogger tutorials! In fact, its very easy task to add featured post slider to thesis theme. And, its great effort on here. Thanks a lot for given great tutorial on here. Thanks,, i will add this slider to my thesis theme.. but i don’t want to install this plugin, can you tell how to add slider like shoutmeloud?? help me!! Shoutmeloud is using the same slider plugin mentioned in this tutorial with little tweaks. If you are not comfortable with coding then I would not advice you to add slider without plugin. It’s good plugin, you should try this. This plugin is really easy to install and customize and it works best with thesis WordPress theme. Any possibility that you could send me the smooth slider plugin? It’s gone missing on the wordpress site! Thanks for the great tips. I want to use thesis but it looks intimidating. Great slider demo too. how do i add featured posts which looks similar to the one u added in ur homepage?? Explained simply !! liked it…searching for thesis code and luckily found it. Thanks for sharing. any idea of adding slider to trending.. Featured posts are something great offering to your readers. I got to know about some new plugins, which I would like to utilise to my blog for sure.